The very first thing you notice about the EVH when you receive the guitar is the beautiful SKB case that comes with it (included with both the USA and “Special” model). The handle is soft and molded to your fingers, and the latches are even really nice and make it easier than normal to lock and unlock your case. Inside, the case is a red velvet look similar to a Les Paul case or Vai’s Ibanez case. Very impressive attention to detail. You will also notice that the case is smaller than a standard guitar case. When you first open the case and see the guitar, you notice right away that the guitar is very small (matches the small case). The guitar is a 22 fret model, so I’m sure this has something to do with it, but I noticed other factors contribute to the size. For example, the frets are closer to each other than all other guitars that I own, making it easier for somebody like myself to stretch since I do not have big hands. The EVH has a reputation for having one of the most comfortable, fastest necks around, and this is very true. The neck is so comfortable, and combined with the fact that the frets are closer together, it truly makes for a great playing experience. The neck has that unfinished feel to it, which I love as well. It feels like they literally turned a piece of wood into a neck, sanded it/smoothed it, and stuck it on the body. The texture of the neck (not the thickness) feels similar to my Jackson PC1, which makes sense because the same people made it. 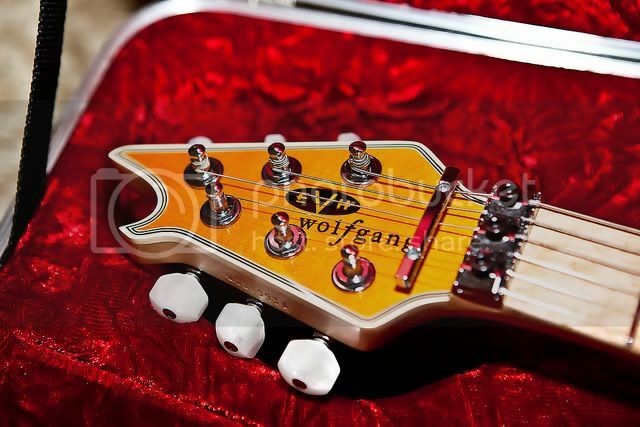 The headstock is rather odd though….it’s so small, I almost feel like it’s not there sometimes. A new feature to the EVH over previous models (Peavey, EBMM) is stainless steel frets. This is a very different feeling than other guitars, but I think people exaggerate the difference. I have heard people on message boards on many occasions say “the guitar looks cool but the stainless steel frets are a real turn off.” I have no idea what their problem is, because they’re a real pleasure to play. The frets are a lot smaller than your average guitar, but I find that it helps me fly around the fretboard easier (picture the closest thing to a fretless guitar, but with frets if that makes any sense). They are great and I really don’t notice anymore (plus they NEVER need to be replaced, re-fretted, etc.). 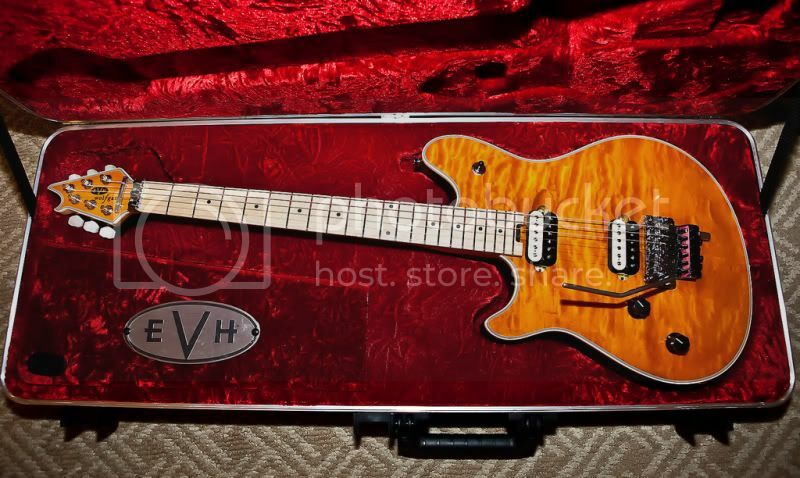 The next thing you will notice about the EVH (USA) is that it’s heavier than it looks. Since the guitar is small and made of Basswood, you would think it’s light as a feather. Nope! My cousin actually picked it up and the first words out of his mouth (after wow this is small) was, “wow this thing is heavy.” The EVH is not Les Paul/ESP Kamikaze heavy….but for what it is, it’s heavy. I have a feeling the THICK maple top has something to do with it. The EVH comes with the “EVH Signature Floyd Rose” for the first time ever. To be honest, I only noticed one difference between the “EVH Signature Floyd Rose” and the “Original Floyd Rose.” The difference is, the trem arm is light as a feather (almost feels like it’s not made of metal) on the EVH Floyd Rose, while the Original Floyd Rose has a solid metal trem arm as most of you know. The D-Tuna is a very very cool tool because switching from standard E to Drop D is a breeze, and takes literally one second. The D-Tuna system can only be installed on guitars where the body is NOT “dug out” for a Floyd. Only guitars where the floyd sits on top of the body can accept the D-Tuna system (think early Baretta or Charvel). Now about the SOUND…. the EVH has a very thick tone to it. The tone is a little bit darker/warmer than the EBMM version (nothing wrong with that). Many people say that you can tell a solid body guitar is of great quality when it is loud when you play it unplugged. This guitar is loud and clear when played unplugged. If I am practicing a song on the couch, reading the notes off of my computer, I don’t even bother going into the other room and plugging in because I can hear the notes perfectly unplugged (this comes in handy). When I DO plug in, the tone is thick, and there is ZERO hint of mud in the tone of this guitar. The notes are clear as a bell, and the tone is crushing. I know this is due to the Basswood with Maple top combo which this guitar is made of. John Suhr has said that a Basswood guitar with a Maple top is the “holy grail of tone” and is his personal favorite combination. Well, that’s what this guitar is made of. The clean tones are very nice as well with this guitar, and I couldn’t ask more from the new EVH pickups…..just a very well designed and thought out guitar. Well, I hope this review was educational and if anybody has any questions, feel free to ask away! Thank you. This entry was posted on Friday, May 6th, 2011 at 3:02 am	and is filed under Reviews. You can follow any responses to this entry through the RSS 2.0 feed. You can leave a response, or trackback from your own site.